My first trip to LA was in 2005. Wait, I should qualify that. My first trip as an adult to LA was in 2005. I’d been to la-la land and area when I was a kid visiting Disneyland, as that is a rite of passage for most middle class children across North America. As an adult I visited LA for two reasons a) my friends were down there doing pilot season and I wanted to see what that was about and b) someone was doing a similar show to Teen Angst, we’d been in contact and I wanted to check it out. 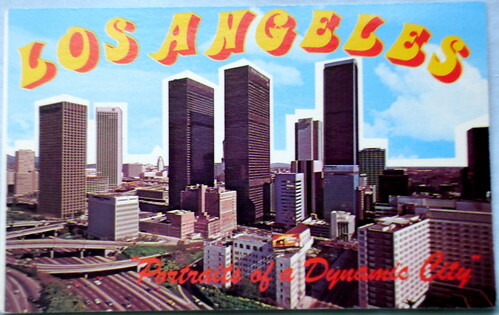 Those turned out to be two very awful reasons for visiting LA. First off my actor friends were living at the Highland Gardens in this Canadian Camp Hollywood of dreamers. Most of the people there were nice but there were a few girls there, 20 year olds with no acting training, pretty faces and 20 inch waists that made me hate the entertainment business like I have never before. That 2005 trip to LA made me feel repulsive, fat and ugly. That’s what hanging around with anorexics will do to you. The most memorable moment was when one girl cried when we were out for lunch. She’d ordered the fruit plate and when it came and was humongous she went into a panic attack. Then there was the comedy show. The first words the LA-based-kind-of-like-Teen-Angst-show producer said to me were, ‘You’re Sara? I thought you were a blonde.” Ugh. The show went fine but I didn’t get any preferential treatment or casual pleasantries I would have expected being from out of town. Yet another blow to my ego and confirmation that LA wanted me to be a skinny blonde girl. I did a pay to play 5 minute comedy set at the Rainbow Room. It’s a tiny upstairs venue filled entirely of comedians and musicians who are just waiting for their turn on stage. Someone came up to me after my set and said ‘That was great, you really took control of the stage. You have great presence.” I’d just finished Studio 58 and was almost insulted by this comment, as in, of course I know how to stand on stage, I just went through three years of people yelling at me everyday if I wasn’t comfortable in front of an audience. But I guess most comics don’t have that training. This weekend I’m going to LA again. I know some awesome people there and I’m going with no shows booked or expectations. I want to people watch and enjoy the sun. Hopefully, I’ll come back from this trip with better stories that these ones for an upcoming Story Time Tuesday. Have you been to LA? Have any suggestions of places I should visit or things I should do? Leave them in the comments. Awesome things in L.A.: Museum of Jurassic Technology, La Brea Tarpits, L.A. County Museum of Art and Abbot Kinney Blvd (check out the iced coffees at Intelligentsia Coffee), tacos at the Farmer’s Market.